I made a new friend early last year, and recently I was reminded of why I LOVE quilting SO much. Besides the obvious a) playing with fabric, color, and patterns, b) designing, c) writing about all of it, d) interacting with the community, e) expending creative energy, and f) therapy. This is g) making stuff for people I love, and surprising them (the best one!). 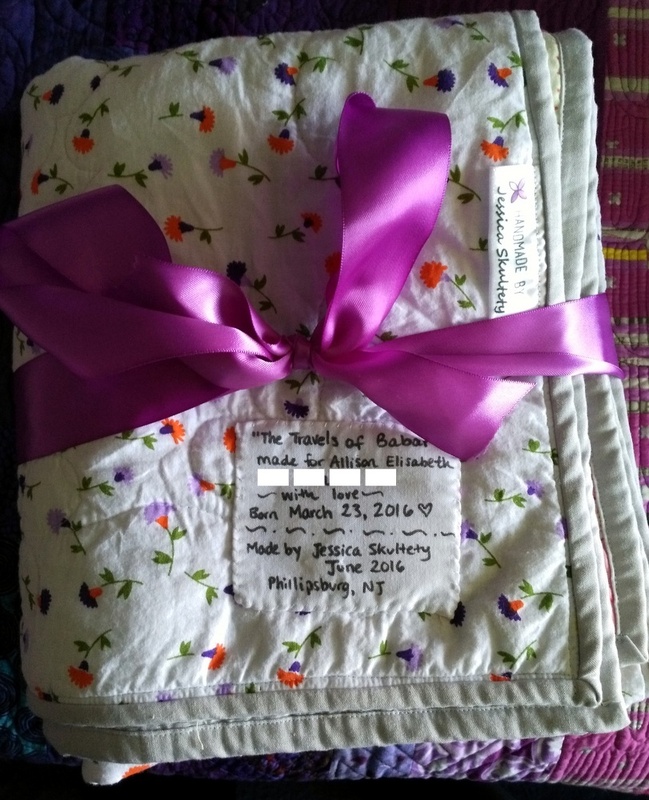 In February, shortly before the birth of her daughter, Sarah asked if she could commission me to make her a quilt. She described in detail how much she loves Babar the Elephant, a staple in French children's books (Sarah teaches French). Her daughter's color scheme is pink and gray. Time-wise, though, it just didn't work out. A week before I saw her, I had a brain blast: I was going to make a version of the quilt she wanted! I knew with some dedicated sewing time, I could finish it within a week! The quilt is based on this lovely free pattern by Shwin and Shwin (but I totally winged it, because that's my specialty, and templates are time-consuming). THAT quilt is modeled after this gorgeous vintage Babar poster. I am so excited about how it came out! See, I even added some cute Paris fabric in the balloon basket! The picture above is all machine applique and a little free motion quilting for the tusk, bow tie, and crown (those little features are really hard to applique! Ask me how I know!). The quilting was really fun and freeing. I quilted random clouds all around Babar's hot air balloon, using Aurifil #2437, a salmon that really popped against the Cloud9 Cirrus Solid (Petal) in the background (obviously chosen to match baby's room). The borders, which were assembled using most of the only light pink fabrics I have, were quilted with an easy loopy flower design that Jess @jtlevitt helped me pick out. Finally, I HAD to quilt the baby's name into the bottom right corner of the quilt! I love how Sarah spells her middle name, and I love that I got to use free motion quilting to truly make that quilt Allison's. I know you want to see the baby's picture (used with permission of course)! It's like she's waving "hi!" :D. The next picture is when I surprised Sarah with the gift. It's so satisfying to gift quilts to people who really, clearly appreciate and use them!! <3 Luckily, I got to meet the little cutie that night. Have I mentioned how much I LOVE babies? Because I do (and even more when they are babies of people I adore). We used my mom's flower garden as a prop. The first picture in this post was a vision I had, and Mike captured it perfectly. This was to show the steep hill we were working on, as well as another overall pic of the quilt! He took a serious risk standing on a really steep incline to get that first shot. Okay, and it was super windy here in New Jersey (as usual). I feel like I'm always waiting for DAYS to get a good shot of a quilt... which is why the main picture (the second one in this post) was taken inside. We just didn't have time to wait for a better day outside, where the natural light is always preferable. Well, I can say with confidence that we were having fun! All wrapped up with a bow! 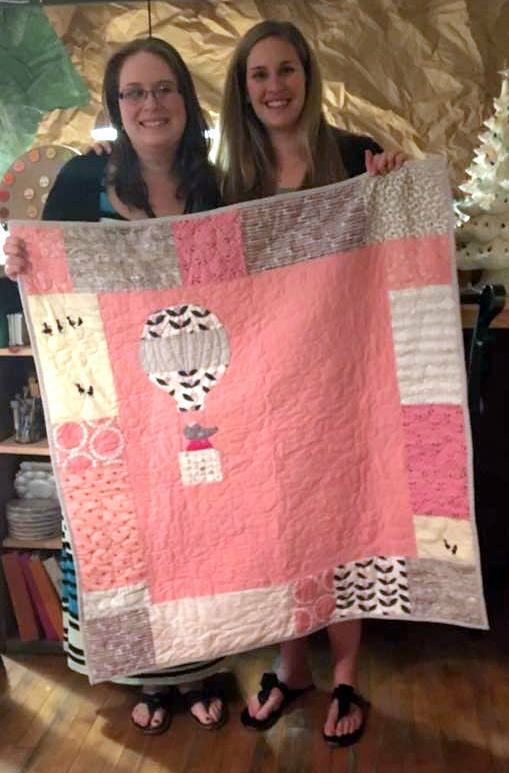 The best way to gift a quilt! What a sweet gift and I know both your friend and her daughter are going to treasure it. 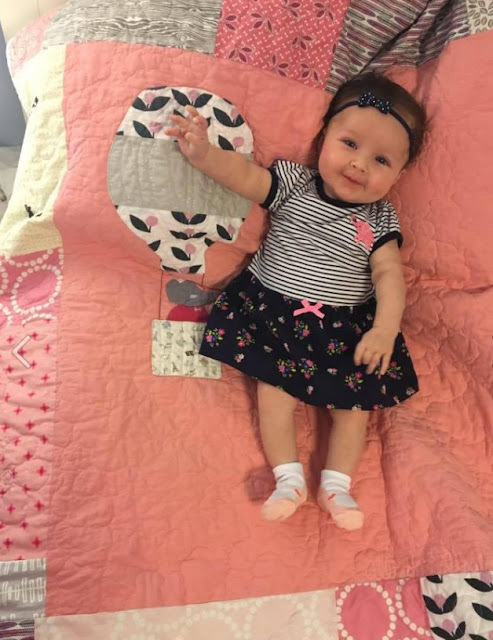 That photo of her waving is just too precious! How lovely!! And such a pretty baby too. Beautiful quilt for a beautiful baby girl. What a lovely quilt for a happy little girl - I love the details you incorporated into it! She's precious! And I like your version with just one balloon and the pink background! the cloud quilting is just perfect for it! I LOVE this quilt!! So simple and so sweet---the perfect baby quilt! And what a wonderful surprise! Gifting is indeed one of the BEST parts of quilting. My husband said something the other day, after I received a couple gifts from quilty friends in the mail--he commented about how he loves that giving is at the root of quilting. Many people put tons of time and effort and money into making quilts, KNOWing that they are making them to give away. There aren't many hobbies/trades like that! He's so right, and the giving is my favorite part! Your story also shows how important it is to have a stash at home -- sometimes you need to make a quilt quickly, and there's no time for multiple trips to fabric stores to find just the right fabrics, and definitely no time to wait for shipping!! I so remember Babar, and you did him justice in this charming quilt. When you see it with the new little owner, you can tell they were meant to go together. Well done! This is the cutest quilt ever, and little Allison Elisabeth is adorable. She is so so cute! This is a really special treasure, Jess. You are so sweet. I agree, a sweet quilt and a beautiful baby. Oh I like your version with just one balloon! And those little C+S windy girls are such a perfect fabric to include! I love the photo of little Allison with the quilt, it helps give me an idea of scale on the balloon.